All Biologically significant events involve multiple senses, and this has obvious survival benefits. When we think of an injury or any event in which pain is expressed in the body, we typically focus on what we are feeling in the physical body. This approach has been reinforced throughout our education, but thankfully we are starting to see a shift from hyper-focusing on the physical location of pain to the whole person. After all, if it was purely a physical issue, shouldn’t we be able to rub, stretch, needle, exercise, or scrape the pain away? Wouldn’t it be great if it were this easy? The unfortunate truth is that we’ve all had clients who just don’t respond to this approach. So where do we go from here? At IKN, we put emphasis on the multisensory nature of our human experience, and integrate multiple senses into pain and performance rehabilitation to facilitate more rapid and longer-lasting change. What is neurology and why use a multisensory approach? Humans are wired for survival. We are constantly scanning our environment for threats to increase our chances of survival. If we interpret a threat, we will MOVE AWAY from the threat to achieve safety. In Lorimer Mosley’s pain neuromatrix theory, pain can be viewed as a “neurotag,” an output from the brain to help us maintain homeostasis. From an IKN perspective, this “neurotag” can be viewed as a snapshot in time of all the sensory inputs (visual input, sound, smells, proprioceptive position etc) as well as the outputs (pain, feelings) at a particular point in time (injury, stress, trauma). So, what if the body part in question is fully healed, yet another component of that “neurotag” is enough to surpass the pain threshold for you to experience pain? Have you ever experienced smelling something and find yourself reliving a past memory? But it’s not just the memory that comes to your mind, the feelings experienced at that time can also elicited? Why would our experience of pain be any different in more chronic situations? Let’s say for example you have had back pain in the past after an injury, and after short while of rest and some light stretching it settles back down after a few weeks. Over the next few years you get frequent “episodes” or “flare ups” of the same issue. This may be in part due to the insufficient rehab of the area to improve the cortical representation of that area. Within your nervous system, you have a virtual body map called the sensory cortex that represents every area of your physical body. The amount of this sensory area devoted to each body part is not dependent on size, but how much neurological innervation that area has. From the image above, we see how the eyes, lips, face, hands, tongue and feet have a larger representation, whereas the lower back and other structures have much lesser. It is postulated that these smaller areas within that cortex are more likely to express pain or stiffness. Going back to our example of back pain, let’s say they go to their doctor to get an MRI, and told that they have a “slipped disc.” Now, we can say that they have a “neurotag” from the initial experience of pain, and a slipped disc “neurotag” from the doctors words. Mosley has theorized that these “neurotags” can overlap, and so now when our client with back pain hears the words or thinks of the words “slipped disc,” it is enough to trigger an output of pain, or at least trigger a threat response. This threat response could be in the form of a spike in cortisol, increased tension, weakness, or pain. From an IKN perspective, we have a few different options in how we can help this client. Of course, using pain science education to develop a platform for safety is the best place to start. 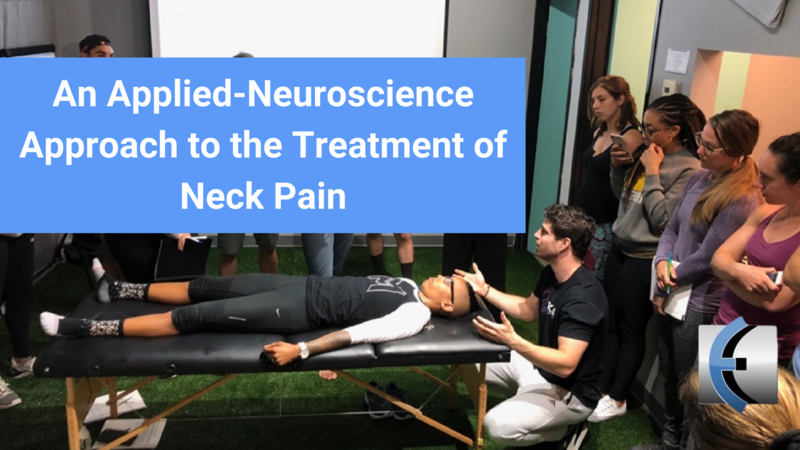 We can work through the input phase first by addressing all the neurological and sensory systems to improve the input back to the nervous system and redefine the cortical representation of the back. This may ultimately allow the nervous system to feel safer when we move. With the IKN approach, we utilize a specific sequence of hands on techniques (which can also be self-performed) in a specific pattern to enrich the brain with more accurate neurological input. We can use certain neurological sensory stimulation drills to improve cortical representation on a different level. With this, our aim is to allow the nervous system to get into the most connected or integrated state by working though the sensory systems, so that when these “neurotags” are activated, it doesn’t cause a threat response and the associated pain output. This is achieved by targeting many different sensory systems simultaneously utilizing applied neurological techniques. Additionally, we use many other specific drills and movement patterns to create this sense of integration in the brain and body to lessen the chances of a pain output. The key is integrating as many systems simultaneously to achieve this state of connection, and doing this in simple manner so that it can be reproduced by the client at home. The more resources we can focus on an issue, the more rapidly we can facilitate change. The more we separate body parts or systems, taking a reductionist view, the slower we respond. With this understanding, wouldn’t it make sense (excuse the pun) to address these along with our current approaches, especially since they may be significant components to the “neurotags” we spoke about earlier? Now, you may be asking, “well we’re always using our eyes and ears, and our vestibular system is always being stimulated with movement.” While this may be the case, we will teach you a specific way to work through these senses to create integration in a very simple manner, but in a manner that makes sense to both you and your clients. Don’t worry, we’re not going to have our clients taste certain foods or smell different things. It is much simpler and more tangible than that. We believe this may be the missing link when treating or training individuals with pain and performance issues. Working through these systems in a simple way, and integrating it with your current skills can facilitate very positive change. Visual and vestibular system influence on neck pain. It’s not all about proprioception. Integrate! Is it really a neck issue or a midline control issue? Ways to assess and approaches to treatment.